This is the Best Homemade Cinnamon Rolls Recipe EVER! 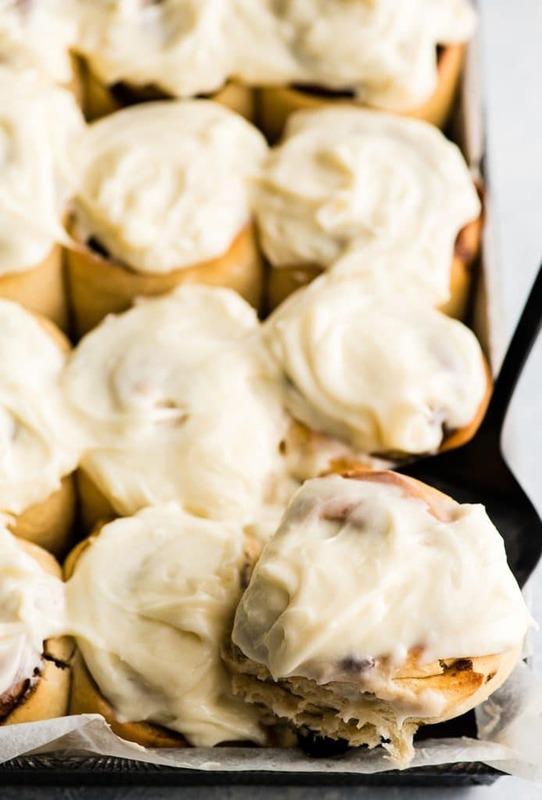 These gooey cinnamon rolls are even better than Cinnabon cinnamon rolls, and are topped with a delicious cream cheese frosting! They’re easy to make and can be prepared the day before and left to rise overnight in the refrigerator. Whenever I need to make a special breakfast, I always turn to this homemade cinnamon roll recipe. Christmas morning, birthdays, you name it, my family requests that we begin our celebrations with these gooey cinnamon rolls. This particular cinnamon roll recipe is a step above the rest. 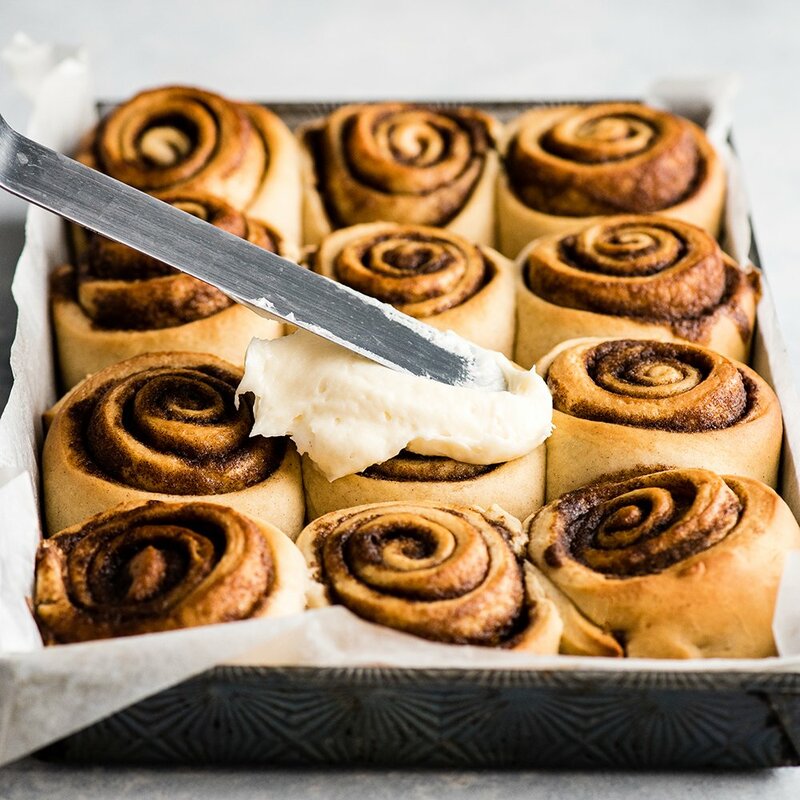 With a few special (but not difficult) touches (which we’ll discuss below), and an easy-to-follow method, you can make the best cinnamon rolls EVER, in the comfort of your own home! 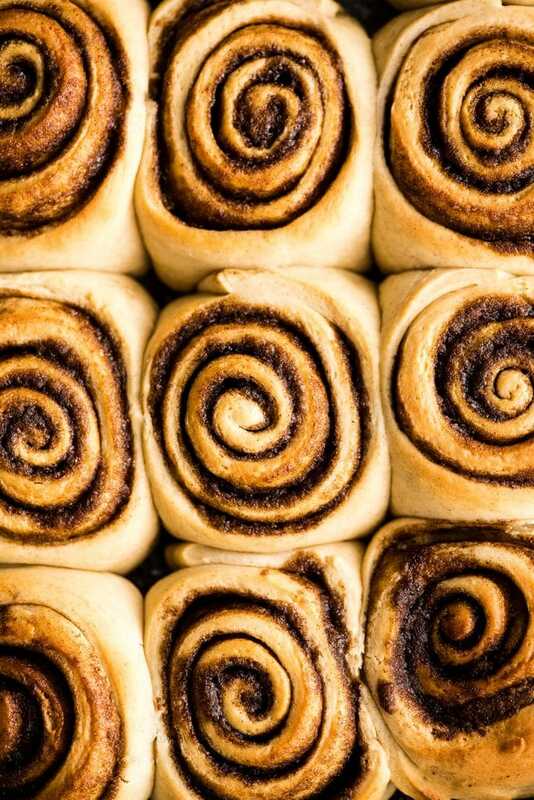 I can honestly say they are even better than Cinnabon cinnamon rolls, because nothing beats fresh rolls straight from the oven! They are also easy to prepare a day in advance and let them rise overnight in the refrigerator, or they can be prepared a few weeks in advance and frozen! 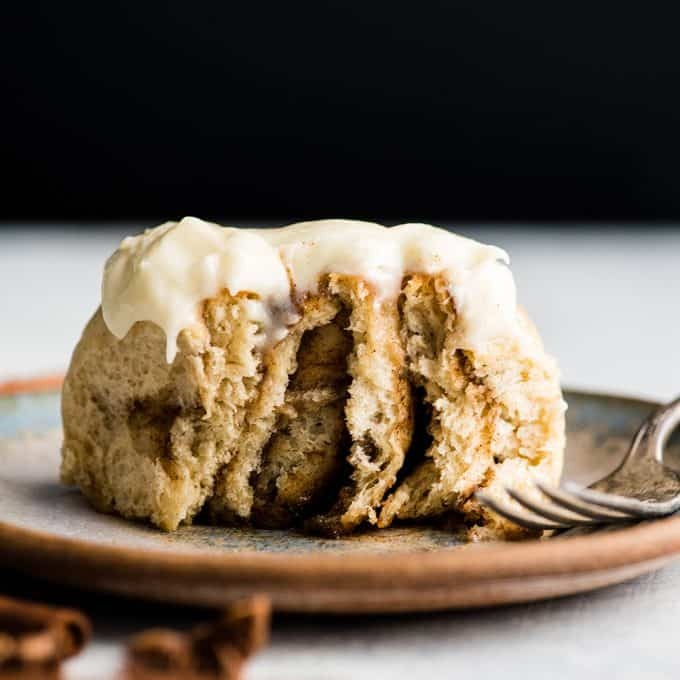 And we can’t forget one of the best parts, these gooey cinnamon rolls are topped with the best cream cheese frosting ever! Once you make this cinnamon roll recipe it is sure to become your favorite for years to come! So let’s get baking! 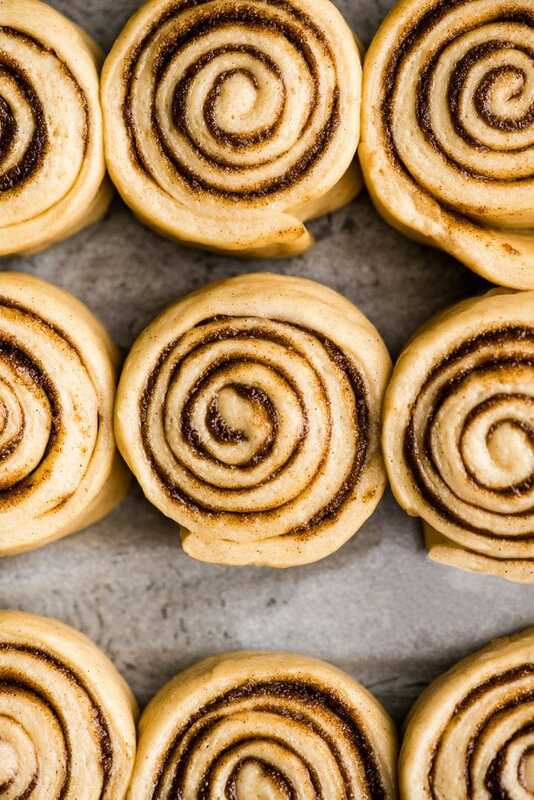 What are the ingredients in homemade cinnamon rolls? These homemade cinnamon rolls contain only a few, common ingredients that most of us always have on hand! Flour, sugar, butter, eggs, salt, cinnamon, etc. 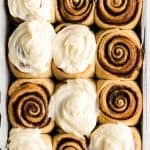 What makes this cinnamon roll recipe stand out among the rest is that there is both vanilla extract and cinnamon in the cinnamon roll dough. These two additions takes these cinnamon rolls from good, to wow those are great! 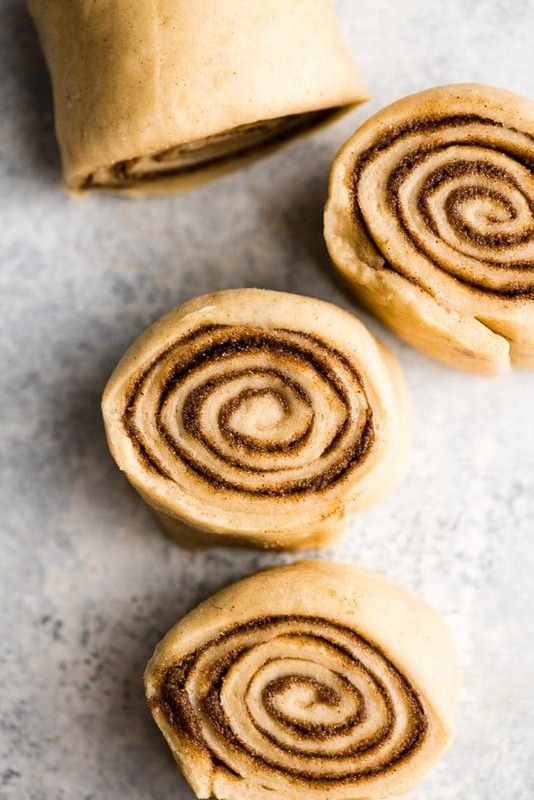 I will discuss the ingredients more in depth above the recipe card, as well as possible substitutions that can be made in this best cinnamon rolls recipe! To help ensure your success in making this Best Cinnamon Rolls Recipe, we are going to walk through every step in the process together! Starting with making the cinnamon roll dough. Just like any yeast dough, start by proofing the yeast until it is foamy. Then add the rest of the wet ingredients stir until they are just combined. Finally add the dry ingredients and carefully knead the dough until a firm, but slightly tacky ball is formed. Start with only 4 cups of flour, and add more as needed. I recommend using a standing mixer fitted with the dough hook to make the dough for these best cinnamon rolls. My only recommendation is to add a about 1/3 of the dry ingredients at a time, mixing after each addition, to avoid making a floury mess! Mixing the dough by hand is also very easy to do! The only difference will be that mixing the cinnamon roll dough by hand requires more kneading by hand than using the standing mixer. 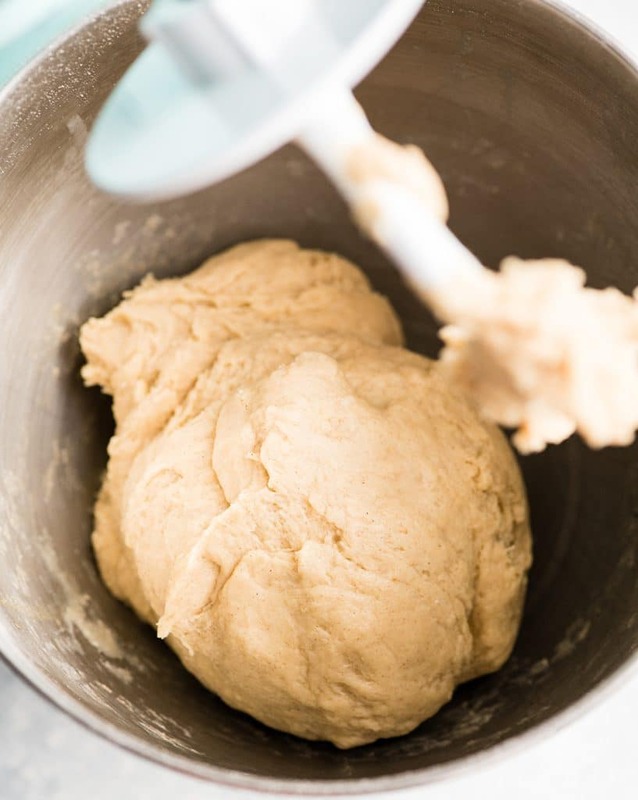 Once a firm but slightly tacky dough ball has formed in the standing mixer (as pictured below), turn the dough out onto a well-floured surface and knead by hand, adding more flour if necessary. Knead the dough for 2-5 minutes, or until it is smooth and elastic, but still a little sticky. Once the dough is smooth and elastic, place it in a lightly greased bowl to rise. I recommend covering it with a warm, damp towel and putting the bowl in a warm place to rise (for about 1 hour). 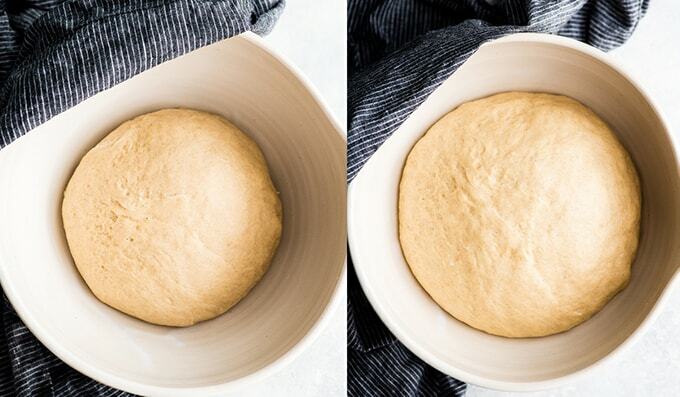 HOW DO YOU MAKE DOUGH RISE FASTER? To help the homemade cinnamon roll dough rise faster simply boil some water and put it in a bowl or measuring dish next to the bread that’s rising. Cover the bread AND the vessel containing the boiling water with a damp towel and let the magic happen! This creates a warm, moist environment that yeast loves. I also recommend putting the dough/boiling water/damp cloth apparatus in your oven with the lights turned on. This creates a warm moist environment that the yeast loves, which speeds up the rising process. Combine all ingredients and then spread onto the dough. 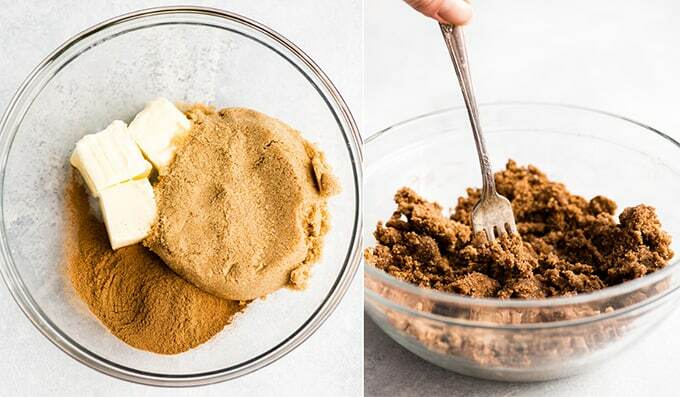 For this method, add softened butter, brown sugar and cinnamon to a medium-sized bowl and combine with a fork until the mixture in homogenous. Then spread this mixture on the dough with your hands and a greased spatula. Combine dry ingredients, but melt butter and brush it on the dough. For this method, combine the cinnamon and sugar in a bowl and mix well. Then, melt the butter and use a pastry brush to brush it on the rolled out dough. Next, sprinkle the cinnamon sugar mixture over the melted butter and roll it out. The second method is easier (in my opinion), because spreading the butter/brown sugar/cinnamon mixture is a touch difficult. However the first method (mixing all the ingredients together) is my preferred method. I prefer this method because the filling doesn’t leak to the bottom of the pan (and out of the cinnamon rolls) as much it does with method #2. There is virtually no filling leakage when all the ingredients are combined and spread onto the dough, but there is some leakage with the melted butter method. 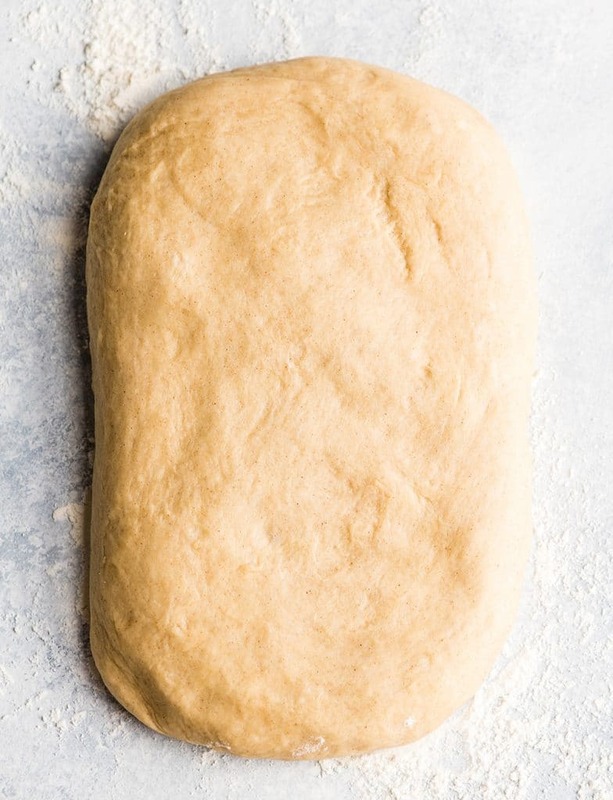 After the dough has risen, press it down to release the air from it and form it into a rectangle. This step is important because it makes it easier to roll the dough into the desired shape (which is a large rectangle)! 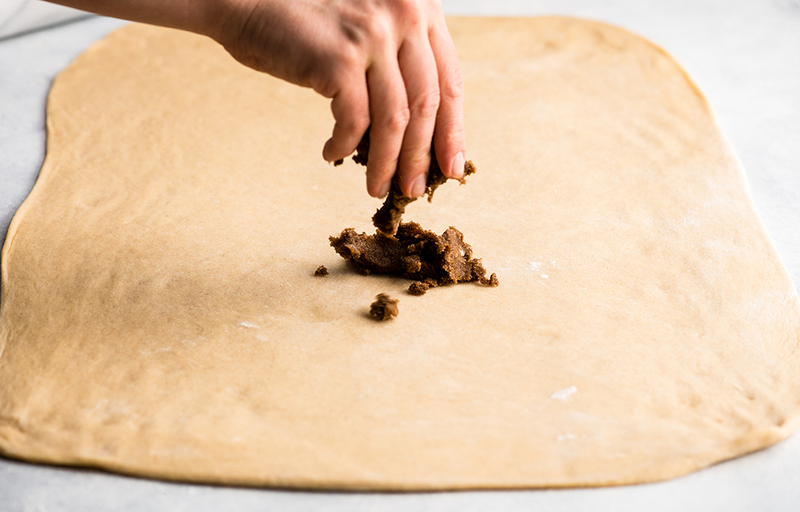 Place the dough rectangle onto a well-floured surface and you are all ready for the next step…. 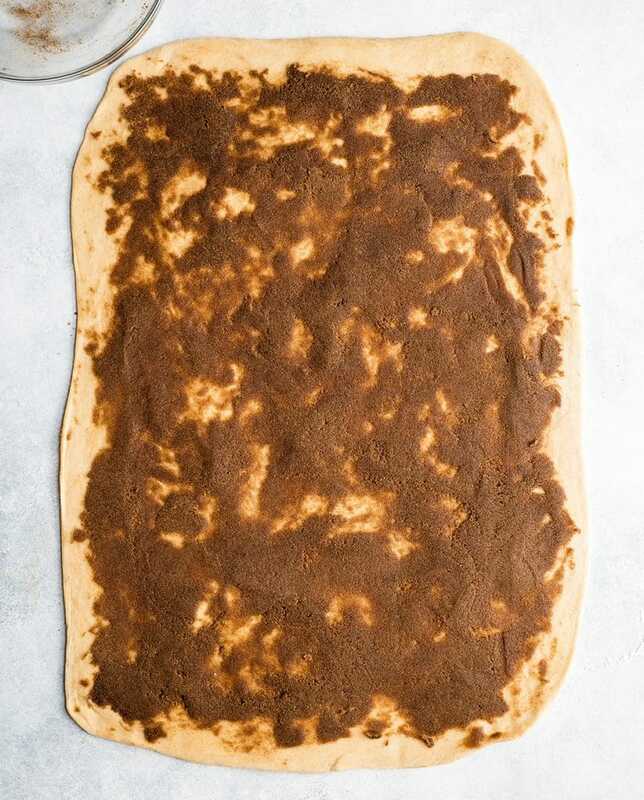 Next, roll the cinnamon roll dough rectangle into a 24×12” rectangle that is about 1/4″ thick. This dough is so easy to work with that this step should be very easy! 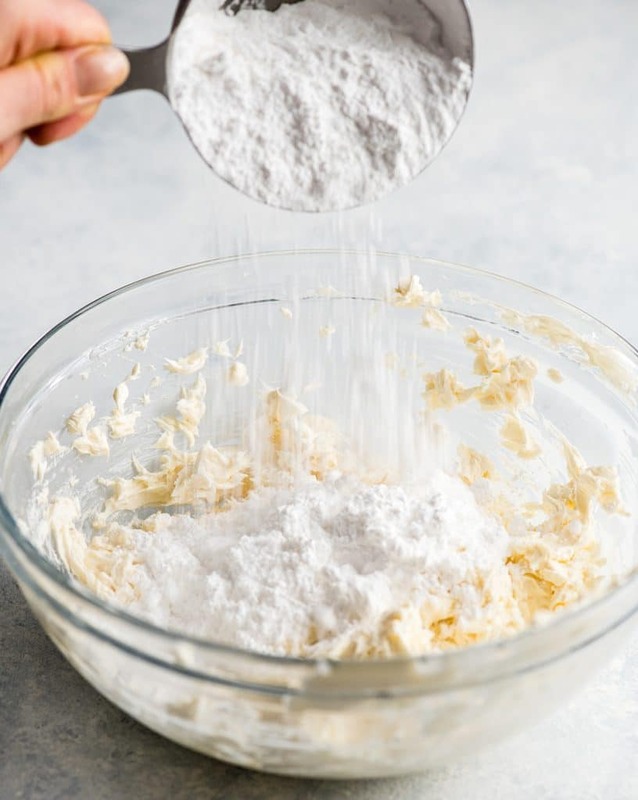 If you find the dough is sticking to the rolling surface, add a light dusting of flour! 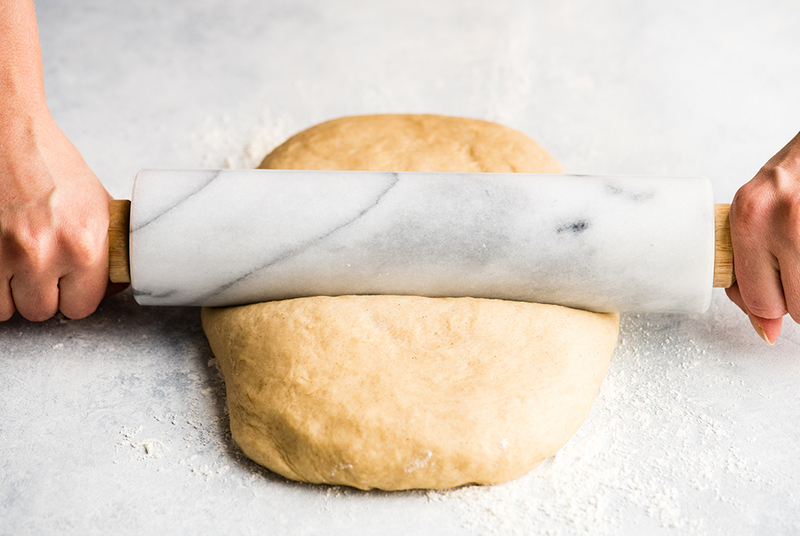 I use this marble rolling pin in every recipe that requires rolling and I absolutely love it. The weight is perfect to get a nice even roll, especially for yeasted dough. Start by sprinkling most (but not all) of the filling evenly over the dough. It will look like there isn’t enough, but do not worry there definitely is. Take a greased spatula and spread the filling evenly over the dough. While this cinnamon roll dough is hearty, you still need to be careful not to tear it while you are spreading the filling. Add the rest of the filling where needed, and spread until it’s evenly distributed. When the filling is evenly spread, it will look like the photo below. Be sure to leave a 1/4″ border around the edges without filling so that it doesn’t leak during baking. It is very important to get a tight roll on the dough. I recommend pulling the dough towards you and gently pressing down as you roll it. 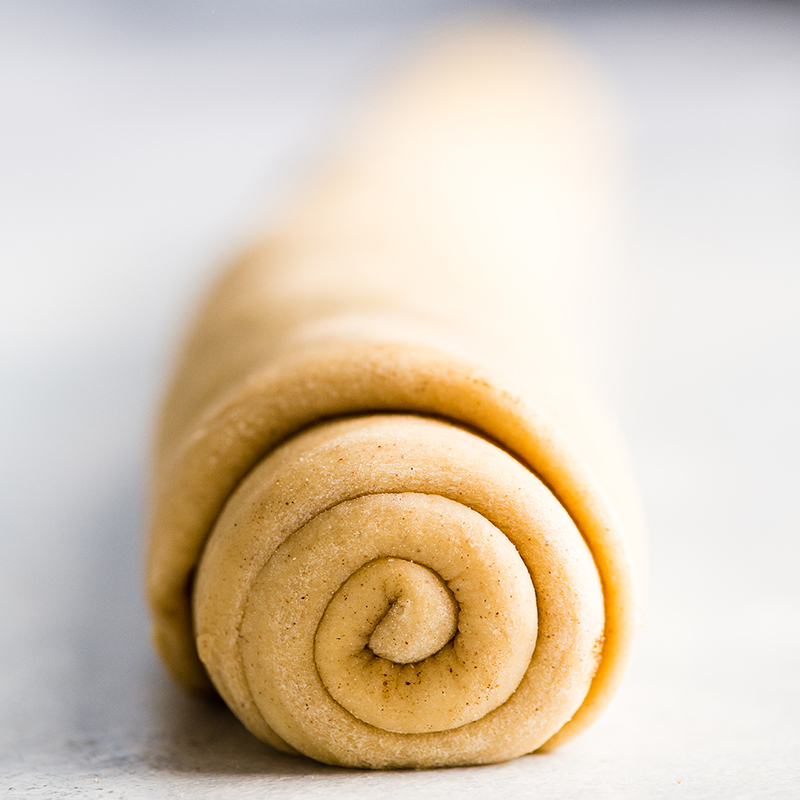 Once you have finished tightly rolling the best cinnamon roll dough, it should look like the photo below. Be sure to pinch together the dough where the end meets the roll, to prevent the filling from leaking. Now it’s time to cut these homemade cinnamon rolls into individual pieces. I recommend using a very sharp knife or even a string to cut them, to avoid smushing the rolls and ruining the swirl. I highly recommend that you do not eyeball the cutting process. 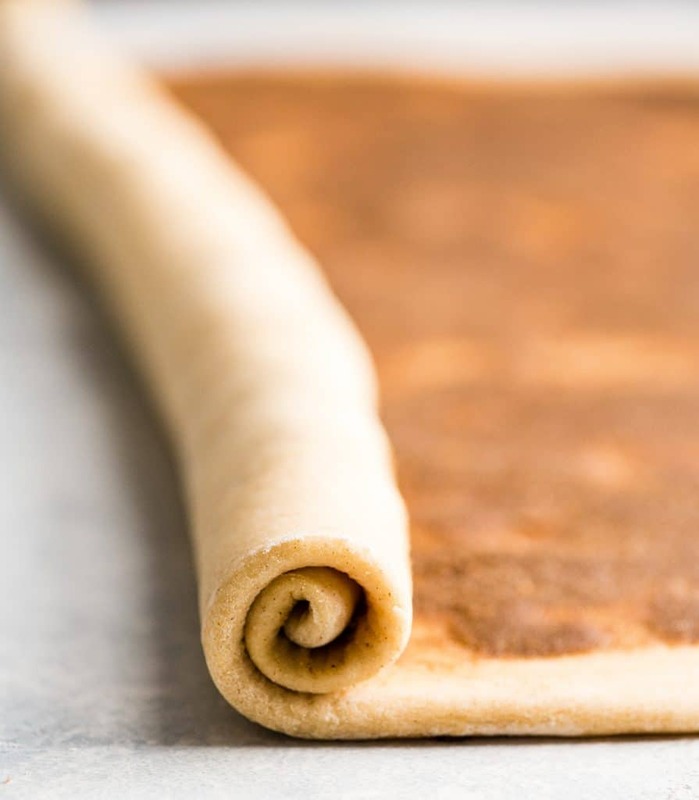 Instead, measure the length of the dough roll (which should be 24″ long) and divide it by 12 to determine how long each cinnamon roll should be. Then, use your knife to make marks at the places you will cut (in the case of a 24″ roll that would be every 2 inches). After you have marked out all of your cuts, then use either a knife or string to cut the rolls. Arrange the cinnamon rolls into four rows of three in a 9×13″ baking dish. They will rise and touch each other, but this is a good thing (as I will discuss later)! I recommend lining the baking sheet with parchment paper to prevent the cinnabon cinnamon rolls from sticking to the pan. Once the homemade cinnamon rolls are arranged in the baking sheet, cover them with a warm damp towel and let them rise until doubled in size. Be very careful not to let the towel touch the tops of the cinnamon rolls. During this rise, preheat the oven to 350 degrees F so the oven is ready to go once the dough has risen (which takes between 30 and 60 minutes). After they have risen, they should look like the photo below. Can cinnamon roll dough be left to rise overnight? YES! I often make this best cinnamon rolls recipe the night before a special holiday or event (like Christmas, my daughter’s birthday, etc.) and let them rise overnight. However, it is very important that you put the dough in the refrigerator. Do not leave them at room temperature, because you run the risk of them rising too much and becoming a big doughy mess. How do you store unbaked cinnamon rolls? To store the unbaked cinnamon rolls in the refrigerator, wrap the pan tightly with plastic wrap and cover it with tin foil or a lid. I often use this glass baking dish with a lid, to ensure that the dough doesn’t dry out overnight. Can you refrigerate cinnamon roll dough? Yes! I recommend refrigerating the dough after it has been cut, as discussed above. Can you freeze cinnamon roll dough. YES! I do this all the time to prepare even farther in advance than the night before. 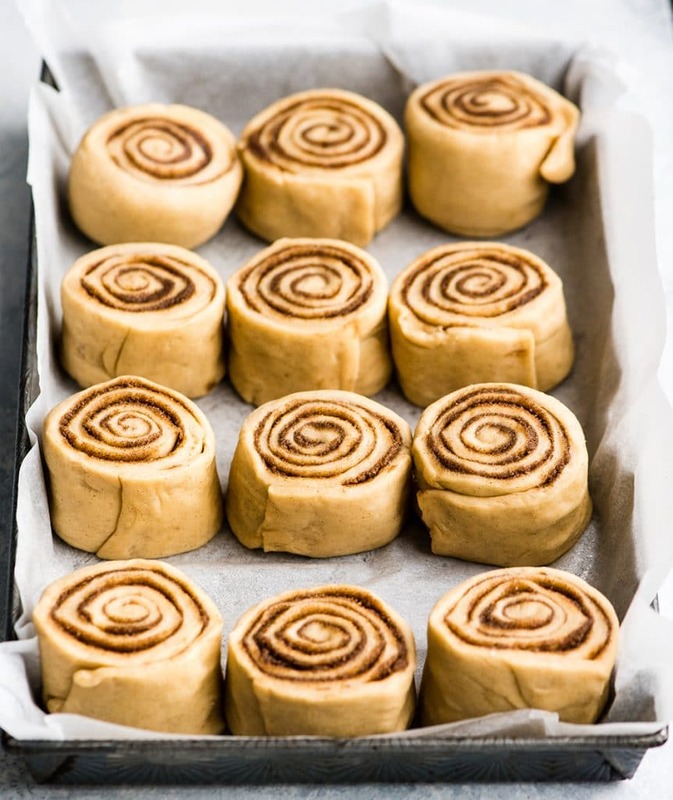 To do this, place the cinnamon roll dough in baking sheet and wrap it as mentioned above (wrap the pan tightly with plastic wrap and cover it with tin foil or a lid). Then place it in the freezer for up to 1 month (but I don’t recommend any longer than 1 month). After the rolls have doubled in size, it’s time to put them in that oven and bake! Something important to note is that this cinnamon rolls recipe will rise more in the oven. So do not be surprised if you see the rolls start to puff up even more as they bake, that is normal and good. What temperature do you bake cinnamon rolls? This homemade cinnamon roll recipe bakes at 350 degrees Fahrenheit (which is about 177 degrees Celsius). Please do not try to rush the baking process by increasing the temperature. It is important to the final rising process that these rolls bake at 350 degrees F! How long do you bake homemade cinnamon rolls? they sound hollow when gently hit with a wooden spoon. the outside of the rolls feel firm (and not doughy) to the touch. Below is a great photo showing how the rolls looked after they have finished baking. In my opinion, there is no other way to top a cinnamon roll than with a delicious, homemade cream cheese frosting. I recommend making the frosting while the cinnamon rolls are baking! This cream cheese frosting recipe is my absolute favorite, and I use it on so many recipes (like this rainbow fruit pizza and this carrot cake and so much more)! 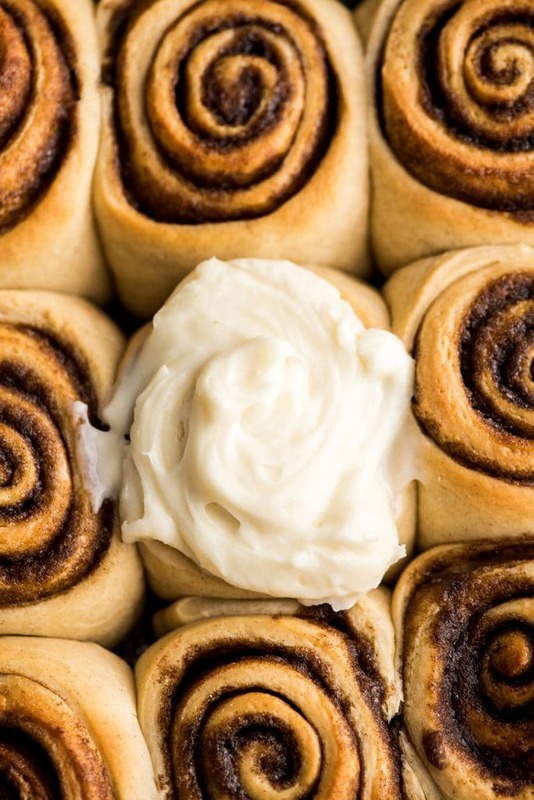 How do you make icing for cinnamon rolls? Use room temperature ingredients. It is critical that the cream cheese and butter have completely reached room temperature and are softened before trying to combine them. Cold ingredients will be much harder to beat together. Thoroughly beat the cream cheese and butter before adding other ingredients. Do this to ensure there are no lumps in your cream cheese frosting. You can use a standing mixer or a hand mixer. Add vanilla and beat again. After adding vanilla, be sure to beat the mixture again until it’s well combined. Carefully add the powdered sugar. I recommend adding half at a time and beating the frosting after each addition. This way you won’t make a big powdered-sugary mess! Finally, beat the cream cheese icing until silky smooth. Make sure to fully incorporate the powdered sugar so there are no lumps! Again, you can either use a standing mixer or a hand mixer! 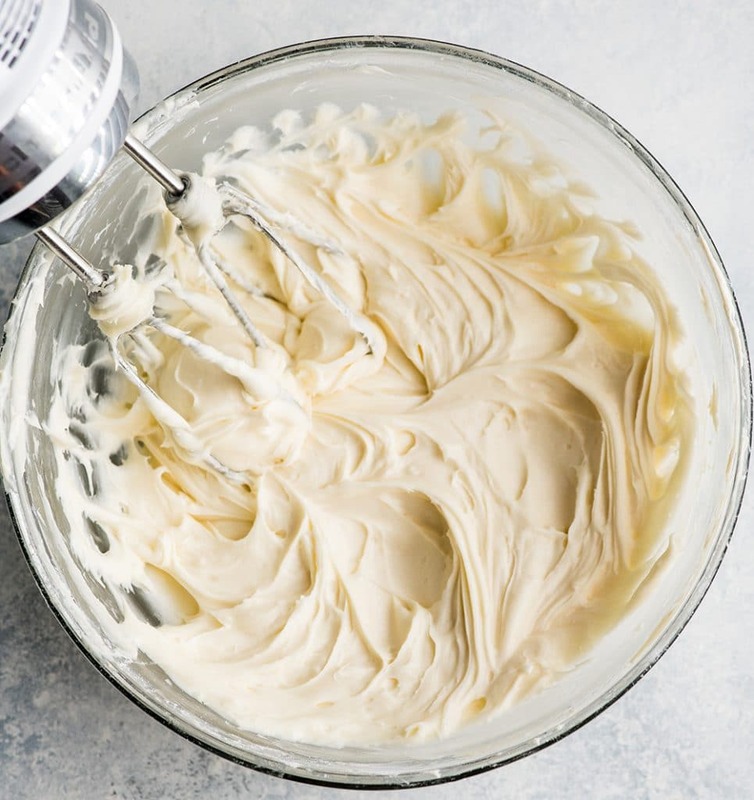 Keep the cream cheese frosting at room temperature. The frosting incorporates into this cinnamon rolls recipe the best when it is at room temperature. If you are making the rolls right away, do not refrigerate the frosting. 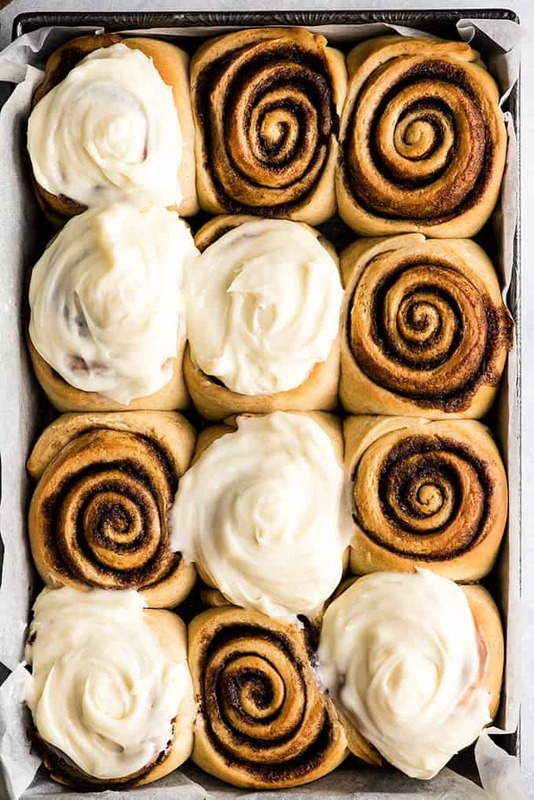 if you are making the recipe the night before to bake in the morning, simply remove the cream cheese frosting from the refrigerator and place it on the counter to come to room temperature as the cinnamon rolls rise and bake. As you can see below, the result is an irresistibly creamy and delicious cream cheese icing that truly makes this the best cinnamon rolls recipe EVER! 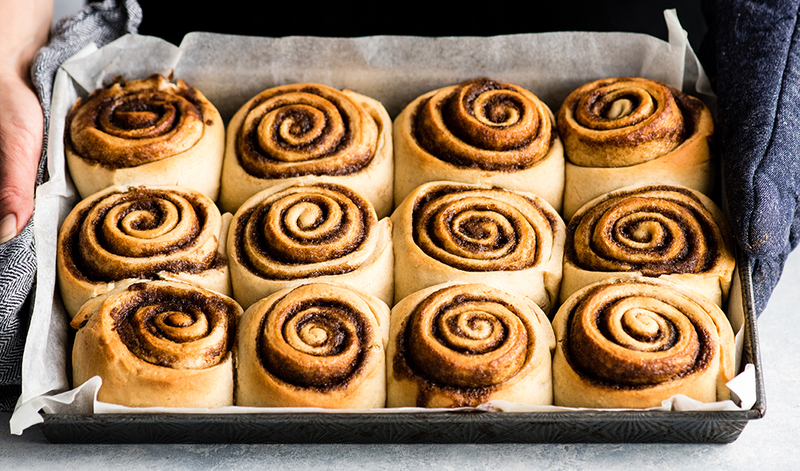 Frost the cinnamon rolls as soon as you remove them from the oven. I cannot stress this enough! Adding the cream cheese frosting to the warm cinnamon rolls is one of the factors that makes this cinnamon roll recipe SO GREAT. Frosting the cinnamon rolls when they are warm causes the icing to melt into the cracks of the rolls, making every bite full of gooey, frosted deliciousness. Finally, it is time to dig in and enjoy these homemade cinnamon rolls! I recommend letting them cool for 10 or so minutes before serving. But eating them warm is definitely the best way to enjoy them! Can you freeze baked and frosted cinnamon rolls? Yes! I have done this many times. Simply flash-freeze the cinnamon rolls on a pan. Once they are frozen, wrap them tightly with plastic wrap and put them in an airtight container in the freezer. To reheat, either leave them at room temperature until they are soft and then microwave for 25-30 seconds, or use the defrosting setting in your microwave to thaw the cinnamon rolls. They can also be warmed in an oven set to 300 degrees! Just be sure to watch them so the frosting doesn’t completely melt! 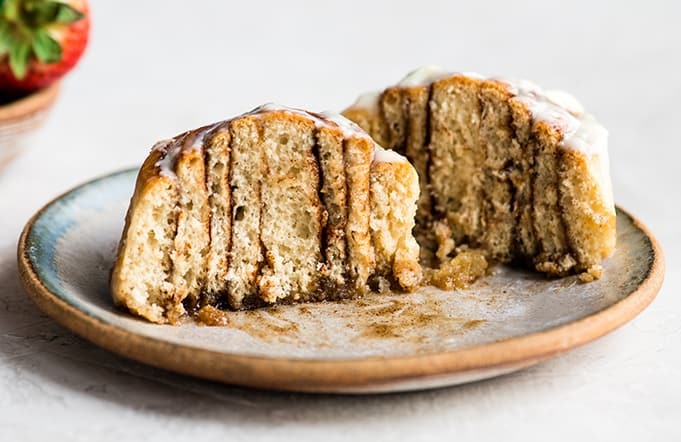 I just want to take a moment and answer a few more questions about this best cinnamon rolls recipe before we wrap it up and talk about the ingredients! Can you bake cinnamon rolls from frozen? I do not recommend baking these directly from frozen for one very important reason: The dough needs to rise. Remove the frozen cinnamon roll dough from the freezer the night before you would like to bake them. Leave the dough on the counter to come to room temperature and rise until doubled in size. After the dough has risen, bake and frost according tot he recipe instructions. How do you make gooey cinnamon rolls? The rolls touch each other while baking. After the cinnamon rolls rise they will be touching each other on all sides (except for the part pointing to the outside of the pan). This keeps the centers nice and soft and gooey! The filling doesn’t leak out. Using the method where all the ingredients are mixed together and then spread onto the dough keeps the filling inside the homemade cinnamon rolls where it belongs, which makes them nice and gooey. Frosting while warm. Like I explained above, frosting the cinnamon rolls while they are warm makes them extra gooey and delicious! How do you re-incorporate the filling if it leaks out? Sometimes things happen during the baking process and the filling leaks out. To get it back into the rolls simply cover the pan of warm rolls with a lid or another baking sheet and invert the baking sheet. This will cause the filling to drip back into the cinnamon rolls and become nice and gooey again! As I mentioned earlier, this recipe took me years to perfect, and as such I do not recommend making any substitutions if you want to make the best cinnamon rolls EVER. However, I know y’all too well to not include some notes about the ingredients and possible substitutions. As usual, I got all the ingredients to make this cinnamon roll recipe from Sprouts! Milk. I recommend using whole milk to make this cinnamon roll recipe, but 2% milk works well too. I do not recommend going lower than 2% because the fat content really matters to making rich, moist, and dense cinnamon rolls! All-purpose flour. bread flour may be used in place of all-purpose flour for a little bit lighter texture. I have not tried using any healthier substitutions like whole wheat flour, so I cannot speak to the success in the outcome if you try it. Butter. I use salted butter to make this cinnamon rolls recipe, however unsalted butter also works well! Brown sugar. I recommend using light brown sugar in this recipe, however if you love the molasses-y taste of dark brown sugar you can use that in place of some or all of the light brown sugar. Ground Cinnamon. The quality of cinnamon used in this recipe really matters. My favorite is Sprouts Organic Ground Cinnamon. It has such a bold, rich flavor that really cannot be beat! Please choose your cinnamon wisely! Cream cheese. Full fat or light cream cheese both work well in this recipe! Obviously, the higher the fat content, the richer the taste. Vanilla Extract. I implore you to only ever use pure vanilla extract in your baking! No imitation extracts need apply here! Best Cinnamon Rolls Recipe (Better than Cinnabon)! This is the Best Homemade Cinnamon Rolls Recipe EVER! These gooey cinnamon rolls are even better than Cinnabon cinnamon rolls, and are topped with the best cream cheese frosting! They're easy to make and can be prepared the day before and left to rise overnight in the refrigerator. Warm milk in the microwave milk for 45-60 seconds. It should be warm but not hot to the touch (about 105 degrees F). Place milk into the bowl of your standing mixer, then add 1 TBS sugar and 1 TBS yeast to the warm milk. Stir and let it sit (proof) for five minutes or until it becomes foamy. Knead dough in the standing mixer until a large ball is formed. The dough should be smooth and only slightly tacky to the touch. If the dough seems too sticky and is not forming a ball, add more flour 1 TBS at a time until a smooth ball is formed. Grease a large bowl and place the dough inside. Cover the bowl with a warm, damp towel and put the bowl in a warm place to rise. While the dough is rising, make the filing. In a small bowl, combine butter, brown sugar and cinnamon until mixture is homogenous (uniform throughout). Set aside. Sprinkle a large work surface with flour. Gently press the gas out of the dough and form it into a rectangle. Spread the filling all over the dough using greased hands or a greased spatula. This process can seem difficult but it gets easier as you spread it. (Alternately: if you only combined the cinnamon and sugar, then melt the butter and use a pastry brush to spread the melted butter all over the dough. Then sprinkle the dough with cinnamon sugar and pat it down gently to insure it sticks). Roll up dough cut into 12 equal sized rolls (feel free to measure and cut each roll to be 2” long). Line a 9x13 inch glass baking dish with parchment paper and lightly grease. Then place rolls in 4 rows of three, evenly spaced. 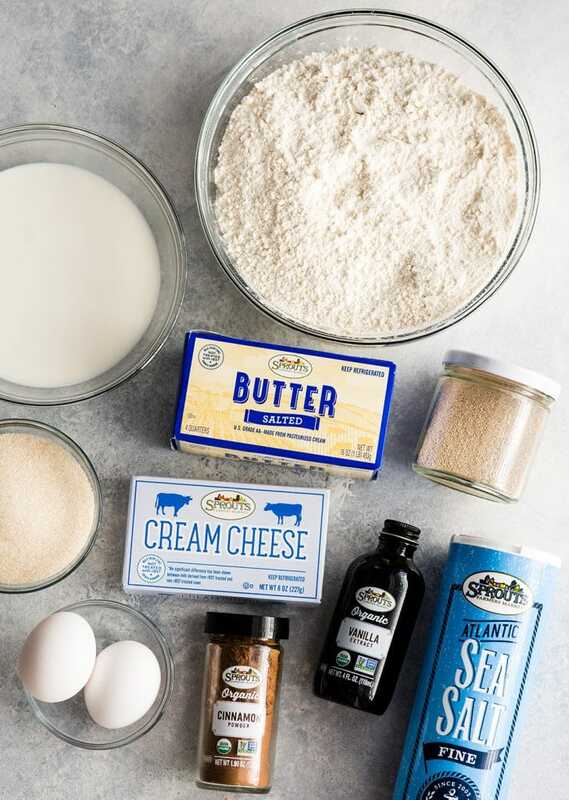 While rolls are baking, beat together cream cheese, butter, powdered sugar, vanilla extract and salt. Do NOT chill the frosting. Keep it at room temperature until the cinnamon rolls are baked. Once the cinnamon rolls have bene removed from the oven, spread the cream cheese frosting on them while they are still warm. I love cinnamon rolls but have never made them from scratch because it’s so intimidating! Just a question- if I make the rolls and refrigerate overnight, do I need to let them come to room temp and rise the next day before baking? Or do they sort of rise in the fridge? Hey Maureen! Usually they rise slightly overnight in the refrigerator, but do need a little bit of time at room temperature to complete the rising process! I’m so glad you enjoyed them Claire! They will be making an appearance in our house on Christmas morning for sure! SO glad you loved them Paola! If I make them and freeze them before baking, do I leave them out on the counter overnight to thaw and rise? Yes! That’s exactly what I do! Sometimes I place a pot of boiling water next to the pan and cover it with a warm, damp towel (the rolls and the pan of hot water), to speed up the process! I brought these to my family for Thanksgiving desert and they were a hit! Might have started a new tradition. Thank you!! I’m so glad your family enjoys them Georgia! They’re our favorites too! Question I’ve been thinking about. I’m so intimidated in making these! So the dough rises overnight in the fridge and you take it out, roll it, cut it and arrange in baking dish. Do you let them rise at this point even though the dough was in the fridge overnight? And how do you get the towel to not touch the tops of the rolls if you are letting them rise at the rolls step? Sorry about the confusing questions! Thanks! So excited to make these! Hey Anisha! The overnight rise comes *after* the rolls have been rolled, filled with cinnamon sugar, cut and placed in the prepared baking sheet. Then pop them in the fridge tightly covered. You may need to let them rise a little bit at room temperature before baking. Lol I just made these tonight. Crazy person that I am, I started at 9:30 and here it is midnight and I’m licking frosting off my fingers. I was testing this recipe for Easter brunch, yep, found THE recipe! Excellent recipe, easy to handle dough. Thank you! I have not made cinnamon rolls in about 10 years. I was looking for a detailed – step by step recipe, and thankfully I found this one. I made these today and my family could not wait to eat them! They were crispy, gooey, flavorful and exactly like your detailed dirctions explained. Looks like we will have to eat something else for breakfast because these yummy cinnamon rolls may not last through Christmas Eve! Thank you! These cinnamon rolls are amazing! 🙌🏻 I made them on Christmas and they were so good that I made them again a few days later, haha. Definitely a staple recipe in our house now. Thanks! could you use almond Milk instead or reg. milk? Hey Monique! I wouldn’t recommend almond milk because the fat content is so much lower than regular milk (I usually use whole or 2% to make these….they’re actually in the oven right now! LOL)! You could try coconut milk for a dairy-free option! Fantastic… the only change I made was 1 cup of sugar in the cream cheese frosting. It made for a perfect treat in this snow storm in Boston!!! I made these this morning. They are OUTSTANDING!!!!! Thank you for sharing the recipe. Loved this recipie! I have always wanted to bake homemade cinnamon rolls but I was always intimidated by it decided to give these a try and they turned out great! Very easy to to make , and very gd . I accidentally rolled it the wrong way and ended up with 6 jumbo rolls. They came out fantastic and I think I’m going to do it this way from now on. Those would be some pretty awesome giant rolls!!!! Yum! Love this recipe! Just made it last nite. The rolls are soft … your descriptions was too long .. they have good tips I skipped most of it 😬 I simply head to the recipe but its ok except that my rolls are not so pretty …but it taste good !! If I want to make them the night before and bake them in the morning can I just leave them covered at room temperature overnight? No they will rise too much! Leave them covered in the refrigerator overnight. Are they still good after they cool off? Should left overs be refrigerated? I am looking to make them the night before for a pot luck at lunch the next day. They are definitely still good after they are cooled, but they are the BEST when they are warm and gooey. I store them at room temperature for 1-2 days if I know they will all get eaten in that time. If they’ll be around longer I store in the fridge or I have even frozen them. I always warm them in the microwave before eating them! Hi! So I made these the first time last week and they were a HUGE hit. Everyone LOVED them. They definitely put Cinnabon to shame! I did have one question, though. So, Instead of cutting the log into 12 pieces, would it work the same if I cut them into 24 to make smaller cinnamon rolls? My mouth is literally watering. I wish this were in front of me. I made this recipe last night/this morning and it was SO delicious! 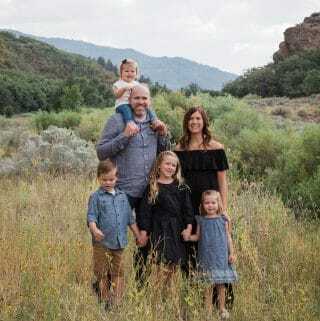 Even my husband commented on how good they were, which high praise coming from him! I was wondering though… I would love to make these “mini sized” so I could take them to a pot luck and not have to cut them into messy looking quarter buns. Do you have any suggestions on how to do that? Thanks!! Can you make the dough in a bread machine then pull it out of the machine before it begins to bake? Then make the dough into the cinnamon rolls. I’ve been cooking for years but I’m just now trying to get into baking. I’ve got Fleishman’s rapid rise instant yeast. Can I use that for this recipe or should I get the regular yeast? Also, if I use the rapid rise, does anything change about the proofing step? Thanks so much! I can’t wait to try these! The recipe would be 5 stars if it had a better balance of sweet/salty. I think it’s way too sweet. My 2nd batch I halved sugar in the dough and definitely in the icing. I have also used salted butter for the filling. This resulted in a much better balance of flavours and it was less sickening sweet. I also think it would be good to advise on the type or cinnamon to use. I would recommend cassia instead of ceylon as cassia has a stronger flavour. I’ve have been wanting to make them for a long time, but felt a little intimidated , but I finally did it they look delicious, I added pecans on top, they were so delicious Thank you. What type of yeast? I have active dry yeast on hand. Yes active dry is what I use! I will clarify that in the recipe! I am pregnant and have been craving HOMEMADE cinnamon rolls all week, so I finally got my act together and made it happen. I followed this recipe almost exactly, but I didn’t have real vanilla so I used maple syrup instead. I also made a slightly smaller roll and used the extra to make a pan of mini rolls, so I ended up with 12 full size rolls, and 12 mini rolls. The frosting was MORE than enough for both pans. I did have to make extra filling for the second roll, but am glad I split them up, as I think they would have been too big for me full size. I’m excited to make these! Did you use unsalted or salted butter in this recipe? I use salted butter but either one works great! Hello, Will it make a diiference if i use instant dry yeast? And how will i do the procedure? Thanks in advance.